I was looking for something else on Flickr, when I came across a bunch of photos posted by someone named “missing person net” 寻人网. Since April 21, 2005, “missing person net” has been posting photos of missing mainland Chinese people on Flickr. 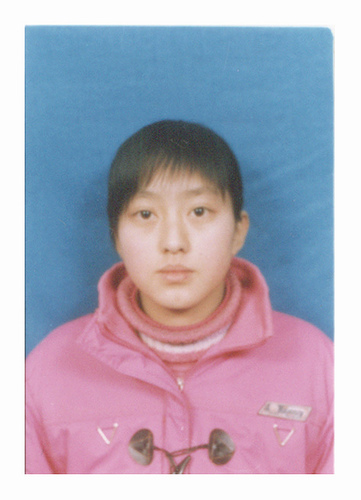 Na Kexin, female, 14 years old, born 1/19/94, inadvertently got lost. Home address: Heilongjiang province, Youyi County, Xinglong Town. Distinguishing characteristics: thin, 1.7 meters tall, medium length hair, fairly goodlooking. Contact number: 13555103059. Family guarantees deepest thanks to those who can provide information. After Baidu’ing the term “missing persons net” this site came up: 110 missing persons net. It posts photos of people who others are looking for. It also has a section called “successful cases,” meaning those which have been solved, which are divided into the following categories: Left on Own Accord; Reasons Unknown; Cheated or Kidnapped (all children); Lost Way (quite a few older people); Lost Touch With Friends and Family (only 3 of these); Orphan Looking for Relatives (only 3); Urban Vagrants (3 young boys). Missing person notice: Liu So-and-so, male, age 16, Liaoning Province Benxi City, left home 9/19/04, family members posted notice on this site 5/8/06. 8/2/06 family notified this site that Liu So-and-so had returned safely home. Advice: Parents should communicate more with children, discover problems in a timely manner, and resolve problems in a timely manner. It is to be hoped that Internet cafes will not allow minors to enter, that work units will not employ child laborers, and that police departments will take more responsibility. Theresa Castro Mirenda had been missing for 2 years. She went to Hongkong on April 28,2005 and then went to Shanghai. She was about 30 years old when she left. If you find any information please send us an e-mail. I work for the justice department in Calgary, Alberta Canada. In April 2005, an unknown male was found. His identity has been a mystery ever since. Possibly went by the name Jay. Believed to be in his mid 20s. Birthdate believed to be Dec 1 but not known about the year. Paul Daniel Raj from Srilanka, he came to China in October 2007 His passport no N1698115 After he arrived in China once he spoke to his mom to srilanka after that no contacts then we heard that he and other 5 people from srilanka were arrested in Shanghai, China. Other lady who came with him is Inthirani Nadfarajah passport no N1492647. Her date of birth was 1958 october 2nd. We don’t know any other news. So please let us know where they are. My sister Monina who is a 25-year old Filipina has been missing since the 15th April 2008 in shenzhen China. She is short-haired, 5 feet 6 inches tall and fair or light brown-skinned. for any information on her whereabouts, please contact 0085393717506.
looking for andrew mickle, british citizen last known to be in china, need to get in touch asap. My good friend Iris Song Dan is Lost.She Lived in Chengdu. I lost contact with her after the the 2008 Sichuan earthquake. She was a teacher there. on my Flickr site and the school she worked at. If you have any information at all please contact me at. my friend Meng yu and her mother Meng xiu zhi have been lost at alberta in Canada.anyone who knows their information,please contact me. his name is Vaughan Atkinson, he is 51 years old with short grey hair,5ft 9ins tall speaks a little chinese and arabic. Could be with a female companion ( chinese). Manasis San Sebastian,24 yrs old, a Filipino male (gay) goes by the alias name Puma, shanon de asis is missing since November 28,2010 in shanghai, China. He left the hotel where he was staying and can not be contacted through his face book account, roaming sim and telephone number. Its not actually my practice to post comments, but i thought i would say that this was really tight. I am desperately seeking for my husband named Armando Jose Rodado – Amaris, a Colombian and a Math teacher. Last time we saw each other physically in Shenzhen Airport on mid June 2009 as he had to fly to New Zealand to study in Massey University, Palmerston North while I myself had to fly to my home country, to study as well in Indonesia.Our contact was only by the e-mails, the last one was three months ago. There is no address nor phone number to contact him anymore. He had left New Zealand last December 2010 and nobody knows where he is later residing.Some people told me that he has visited Cebu, Philippines, several times during 2010 and later stayed in Nanjing, Jiangsu to teach Math in China but no more information. Anyone who knows about him in Philippines, China or somewhere else, please let me know I am his legitimate/ formal wife. I will be very much thankful for any help or information. My husband Hock Seng (Patrick)Choo went to China on 30/11/1995. I found so much more in this site! This is very inspiring! I, too, like to take photos but I always found it difficult to take photos of such amazing things. Now, I’m beginning to think I should try much harder! You really must devote a lot of time on this. Wow! Your site is excellent! I love those amazing photographs. I will be back as soon as I could to enjoy all your material. This is a great website; well laid out, attractive and very educational. I thoroughly enjoyed viewing it, and appreciate the tremendous amount of work that must have gone into it. Thanks!! I was looking for pictures of clouds, and I found so much more. Thank you for setting up this site, it was education & more importantly, beautiful. Very interesting site. You are a smart guy! Good luck with everything you do. I enjoyed all. Thank you for the info. There are so many fronts that we as individuals are losing ground on as we continue to digitize and globalize. You and your organization are very important. I believe this is necessary for them, for their place is too big. It’s sad to read about missing people. I hope all the people in this thread found their loved ones.